Twitter just exploded with memes and jokes over White House Chief of Staff John Kelly's facepalming reaction to Donald Trump's Tuesday speech at the UN where he lambasted "Rocket Man,” Kim Jong-un, "rogue" Iran and "dictatorship" in Venezuela. 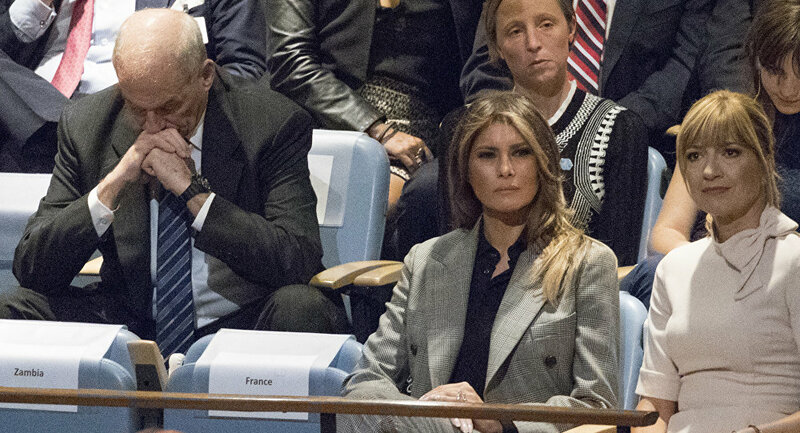 Sitting right behind First Lady Melania Trump, Kelly, once dubbed the Beacon of Discipline by the New York Times, was spotted putting his left hand over his head while the US Commander in Chief was addressing the 193-nation body. Photos of the White House chief of staff’s frustrated reaction immediately went viral online resulting in a flurry of tweets. — Kyle Feldscher (@Kyle_Feldscher) 19 сентября 2017 г. Some people noted that retired General John Kelly was having a bad day and questioning his own legacy during Trump’s speech. — VoteVets (@votevets) 19 сентября 2017 г. ​​One Twitter user noticed the similarity between John Kelly and a Star Trek meme. — Nick Jack Pappas (@Pappiness) 19 сентября 2017 г. ​Some suggested that the people sitting right next to Kelly did not look particularly happy about the president’s speech. — TruthInGovernment (@TruthinGov2016) 19 сентября 2017 г. ​Others thought Melania Trump was looking at the president in a bewildered manner. — Chelsea (@Chelseashow) 19 сентября 2017 г. ​This isn’t the first time the White House chief of staff looked upset during a Trump speech, though. He reacted in a similar fashion last month when Trump told reporters that there were bad guys “on both sides” of the riots in Charlottesville, Virginia, that left one woman dead and injured dozens of others.